The following 4 videos show what patients can do when they are able to access their records oinline. The videos use the Test Patient's passwords and pass phrase. You can have a go your self by clicking here to try the Test Patient record yourself. 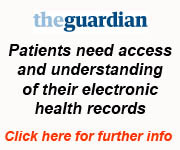 There are lots and lots of links on the home page to help you to understand your GP electronic health record better, what services and information is available and who to turn to for help when you need it most. There are lots and lots of things you can learn from about your health which could come in handy one day when you need it most! Spend 15 minutes today familiarising yourself with the home page and it could save you a lot of time and bother in the long run and help you and your family stay healthy. Using HealthSpace to record and monitor your personal information such as blood pressure, weight or set reminders for appointments that you may have e-mailed to you. (Please note - although the home page has now been updated, HealthSpace is now within the Self Care section of the home page). Here is a video showing why you should look at Practice Services and how we have made a framework to help you to learn more about your own health and how to get the best from the practice and the wider NHS. We have given examples of 6 diseases (asthma, hypertension, diabetes, heart disease, eczema and depression), one normality (pregnancy) and one prevention (immunisation). Once you have understood how this works, you can have a go and "create" your own "care" and then check with clinicians to ensure it is "right"